I am a creative technologist with a human side and I am proficient with both server- and client-side scripting technologies. I am able to work on code and/or design and I am more than happy to learn new techniques. I'm a psychiatric nurse with the ability to talk, and perhaps more importantly, listen. I'll design and code your site to W3C standards and ensure that all of your audience will be able to access it no matter their level of ability. Have a look at my previous work; drop me a line and we'll see where we can go together. 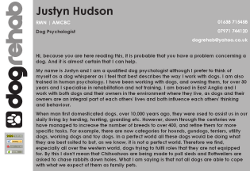 Dog Rehab – Website for Justyn Hudson who is a Dog Psychologist. Used @font-face (particularly Daniel for the hand-written sign-off, and Century) and hCard in order to recreate and complement the look and feel of his business cards. Again used CushyCMS to enable the client to edit the main content of the site without allowing them to kill the layout (I have moved over to CushyCMS for CambsTREC, Da Cunha Dressage and the Barnwell Driving School). 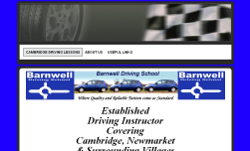 Barnwell Driving School – Website for Mark Crisp who has been teaching people to drive for just over 10 years in and around the Cambridge and Newmarket area. He teaches a wide range of pupils from the age of 17-70, including beginners, refresher, confidence building lessons, motorway tuition, pass plus and fleet assessment's. 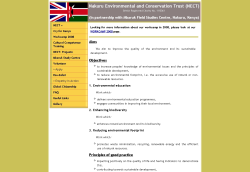 Site built using jQuery and valid XHTML Strict and CSS. The excellent visuals were created by Mark and optimized for screen display by me and the tag soup created by MrSite's WYSIWYG editor was tidied to allow Search Engine's to see the content of the site more easily. The titles of the pages were also made much more descriptive to aid searching. Da Cunha Dressage – Profile website for Jo Lee who teaches and trains people on their horses and is looking to extend her client base. Looked at creating a three stage design with a header (with menu), body and footer (with contact details). I took a photo of a horse near the river which served as a backdrop to the header with Copper Plate text. 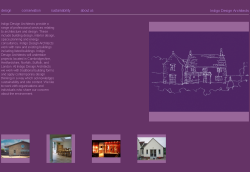 jQuery was used to create the sliding menu effect as well as the lightbox gallery. My original colour scheme used colours based upon the header image using color hunter (Dig those groovy Americanized spellings!) - though the client's specified colour scheme grew on me. Eric Meyer's reset.css is again used to provide a level playing field. 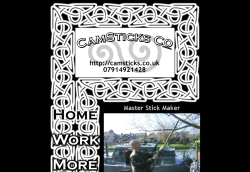 CamSticks Co. – Advertisement site for this new Cambridge based stick making company. Used Eric Meyer's reset.css to ensure that users of all browsers have the same experience. Effects are powered using the jQuery library. Graphics are based on celtic themes (The pattern was designed by myself in the SVG graphics format - it is based on 2 different glyphs which are transformed in order to create a seamless piece of knotwork) with the font being Copper Plate, this combination was used as the client lives afloat and I was seeking to mimic Narrowboat sign-writing. CambsTREC – A site for a friend. Used Yahoo's reset-min.css and fonts-min.css in order to level the playing field amongst different browsers and Ryan Fait's Sticky Footer in order to keep a set of links at the absolute bottom of each page, unfortunately Yahoo's fonts.css kills any attempt at CSS validity. Created the logo for the site in InkScape which is also used as promotional material. Used PHP and TinyMCE to create a .txt file based editing facility after failing to teach the user NVU and having her 17 Year old son kill the layout. Anil Barnes – Updated Site using more traditional approaches and a fluid layout and incorporating SEO techniques. The number of images and the exacting requirements of the client led me to create a PHP script (makeSquare.php) which automated the creation of thumbnail images of a given aspect ratio and with a suitable background colour. NECT – This site for a charity uses ECMAScript to automate page element creation via DOM manipulation. It also utilises lightbox to get greater impact from the number of sumptuous images made available by them. While the exact percentage of users who either disable ECMAScript or use browsers without ECMAScript is unclear it is generally reckoned to be between 5% and 10%, thus using ECMAScript for page element creation might mean that 1 or 2 out of every 20 users will have a less than ideal interaction with the site. I was keen, however, to further explore the abilities of ECMAScript within this context, especially as the client was unsure about the scripting capabilities of the hosting which he had purchased. 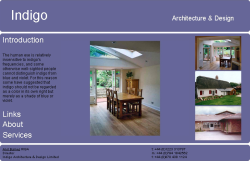 Anil Barnes – Initially working as a consultant I designed this dynamic single page site for Indigo Architects. The client wanted complete visual control without resorting to proprietary technologies such as Flash. The site is optimised to work on 800�600 display resolutions without looking too cramped upon larger displays and primarily uses three slideshows created using ECMAScript to show examples of the practices' work. Significant care was taken to allow the client to update/alter the site when required, this is reflected in the readme and the general cleanliness of the code. Though Flash is notorious for not being accessible to disabled users the approach I opted for is also problematic as screen readers do not recognise changes to the structure of the page made after the page is loaded.